But upon further consideration, we need to issue a correction: It’s not a house, it’s a veritable skyscraper of cards EPA has constructed. That’s because EPA took its highly suspect worker exposure level and combined it with a hazard value EPA erroneously asserts demonstrates minimal hazard, in violation of its own and other authoritative guidance. This test does not provide complete information on all aspects of reproduction and development. In particular, it offers only limited means of detecting post-natal manifestations of pre-natal exposure, or effects that may be induced during post-natal exposure. Due (amongst other reasons) to the relatively small numbers of animals in the dose groups, the selectivity of the end points, and the short duration of the study, this method will not provide evidence for definite claims of no effects. Thus, EPA simply cannot conclude even that the test establishes the chemical causes no acute effects, let alone that it has no chronic toxicity or that chronic toxicity testing is not needed. This test does not provide complete information on all aspects of reproduction and development. In particular, it offers only limited means of detecting postnatal manifestations of prenatal exposure, or effects that may be induced during postnatal exposure. Due (amongst other reasons) to the relatively small numbers of animals in the dose groups, the selectivity of the end points, and the short duration of the study, this method will not provide evidence for definite claims of no effects. We should note that EPA does, in a separate section of the draft risk evaluation, paraphrase (without citation) the first part of this quote’s admonition. But EPA conveniently leaves out the second part, which would otherwise thwart EPA’s intent to conclude the chemical presents no risk and to argue that no further testing is needed. 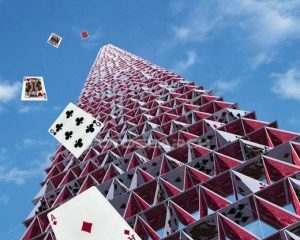 The problem is that somebody is going to get badly hurt when this skyscraper of cards collapses. This entry was posted in EPA, Health Policy, Regulation, TSCA Reform and tagged Lautenberg Act, Pigment Violet 29 (PV29). Bookmark the permalink. Both comments and trackbacks are currently closed. US EPA Superfund ID # OHD980612188 is one of twenty-seven Alternative Superfund sites in Region 5. Closure was 12/1979. It has an estimated 51,500 drums; about double “The Valley of The Drums” & 21,500 more drums than what was left at “Chem-Dyne”. DOE & Agriculture were both sent “special request letters” by Region 5. List of bankruptcies/mergers: PPG venture with Corning, Spinnacker Coatings, Dana Corp, GM, Delphi, Kaiser Aluminum, Astro Container, Browning-Ferris Industries, Home Insurance, Cincinnati Milacron, Whirlpool, Carboline(RPM International),Chem-Dyne, & subject site. Monsanto’s Ciba-Giegy and now Monsanto too have disappeared into mergers. Waste Management finally loses 2nd case against plaintiff RESA in SW Ohio District court case 3:04cv013 Doc 267, “this court will direct the entry of a declaratory judgment in favor of Plaintiff, indicating that CWM is responsible for 49.5% of all reasonable and necessary response costs, consistent with the NCP, Plaintiff (or its successor) has incurred since February 1, 2009, and will incur in the future to complete the RI/FS and to construct any remedy ordered by the U.S. EPA. RI/FS does not test pentachlorophenol for dioxins. There is no dioxin treatment planned. Region 5 never mentions dioxins in RI/FS, ROD, or ESD. Region 5 switches ROD in mid-stream – dumping public commented full treatment version – to accept Waste Mgmt proposal as ROD that provides “proportional” treatment which only removes & treats liquids. All solids & sludge deemed solid contaminants are mixed as one without treatment. DOE didn’t have, but now has, waste that can’t be deemed treated. Dioxins at source volume & concentrations have, roughly 360 to 500 year life cycle for ROD Natural Attenuation. ROD does not evaluate full life cycle and uses 7% reference, required guidance instead of OMB Circular A-94 real rate essential for PV estimate. Results in underfunded and inadequately timed response. There is no RCRA applied to any of the waste. The community could use so legal help.